Climatrol Inc. provides professionally licensed boiler service for customers in Clarksburg and throughout our service area, including Bridgeport and the surrounding areas in West Virginia. We install, repair, and offer maintenance service for residential and commercial gas and oil boilers. We carry a full line of modern, energy-efficient boilers that can help slash your energy costs. Climatrol is proud to be the region’s trusted boiler service contractor, with licensed plumbing and electrical staff on hand to ensure that you get the results you need promptly, without dealing with guesswork or inferior workmanship. We have been serving local residents since 1969 and continue to provide the same level of integrity and dependability that you have come to expect from our family company for over four decades. At Climatrol, we focus on providing the best possible service for our customers. We inspect, diagnose, and provide accurate repairs for all major brands and models of boilers. If you are looking for a new, more energy-efficient unit, we will evaluate your heating requirements and consult with you to discuss with you what options exist and how you can best meet your heating requirements based on your budget. Most older boilers that are still in use are operating at or below 50% efficiency. Let us help you increase your fuel efficiency to 85% or more with a new state-of-the-art boiler. In most cases, our customers’ replacement boilers essentially pay for themselves (in fuel savings) within two to three years. It is important that you hire a professionally licensed and insured professional to install your new boiler to safeguard your investment. All of our technicians are certified to complete your installation according to state and local codes and standards for your safety, and to help you get the longest possible lifespan from your purchase. 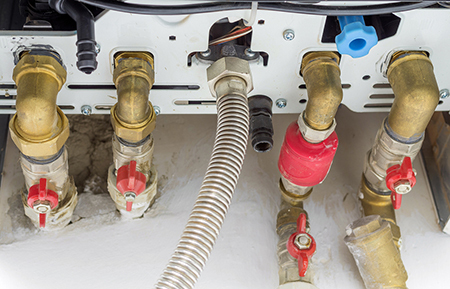 If a warranty is offered by your boiler manufacturer, you must have the unit professionally installed in order to utilize the warranty, if necessary. As always, we respect your home or business during installation, so you can rest assured that your repair or installation will not damage your existing carpeting, furnishings, etc. To request a quote or schedule a service call, contact Climatrol at: (304) 623-0606.